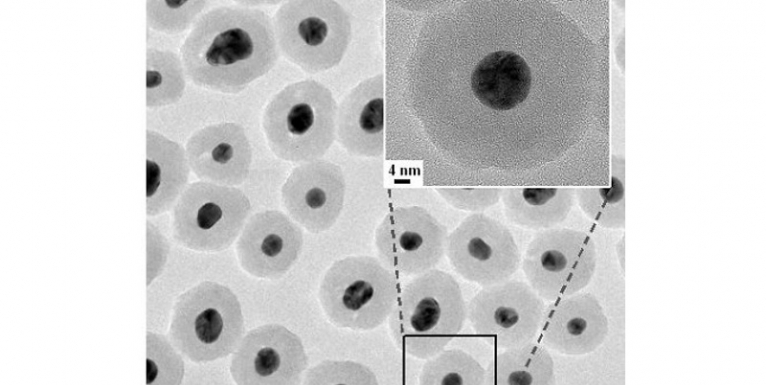 An electron microscope image of silica (grey) coated on the surface of gold nano-particles (black). A silica shell with a similar thickness is formed on each of the gold nano-particles. A Korean research team has successfully developed a technology to produce memory devices using chitosan extracted from crab shells. This technique is expected to be usable when making memory devices for eco-friendly and bio-friendly electronic equipment in the future. ​Lee Jang-sik, professor of the Department of Materials Science and Engineering at Pohang University of Science and Technology (POSTECH), announced on Jan. 12 that his research team has succeeded in developing bio-friendly memory devices based on chitosan extracted from the shell of crustaceans like crabs or shrimp. The newly-developed chitosan-based device can satisfy the product performance necessary for memory devices in terms of durability and the ability to store information. In particular, the device uses by-products of seafood, and thus it is not expensive to manufacture. Most of all, the new memory device is likely to be utilized in many areas, since it can be attached to or inserted in the skin, unlike existing silicon devices. Therefore, it could be used in the medical engineering area to make next-generation capsule-type endoscopes, artificial muscles, artificial organs, and patch-type electronic devices. For full article, see KoreaBusiness. The government and six private companies will jointly invest in research and development (R&D) of new technologies by a third party, the commerce ministry said Thursday. An investment agreement was signed Thursday between the Ministry of Trade, Industry and Energy and six private firms, including the world’s largest memory chipmaker Samsung Electronics Co. and SK hynix. Under the agreement, the government and the six companies will jointly invest 25 billion won (US$22.27 million) over the next five years in R&D projects by universities or other independent institutes to develop new materials or technology for memory chips. The program will be the first of its kind as previous arrangements for joint R&D investment mostly entailed government support for R&D activities by the firms themselves. 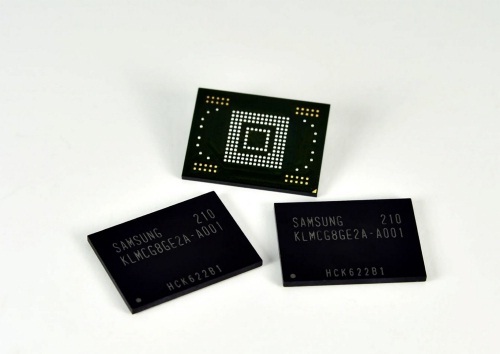 Samsung Electronics, the world’s largest memory chip maker, announces that it has already cranked up assembling 64 gigabyte eMMC(embedded Multi Media Card), an internal storage for a Smartphone, starting last month. The world’s fastest “64GB eMMC Pro Class 1500” is based on a 20 nanometer (nm) class process technology, 64GB, Toggle DDR 2.0, and strictly follows the international standard JEDEC’s size of eMMC 4.5. Introducing “32GB eMMC PRO” this past May, Samsung Electronics with its recent release has become the largest eMMC manufacturing unit in the market. 64GB eMMC Pro reads at 1500 IOPS, 4 times faster than existing eMMC 4.41 at 400 IOPS (Input and outputs per second). Later this year, it will be applicable to next-generation smartphones and tablet PCs, enabling people to watch HD (High-Definition) and 3D contents. Samsung Electronics plans to invest some 4 trillion won (about $3.4 billion) to build a new chip plant in Hawseong, Gyeonggi Province, where its key chip lines are located, Samsung officials said, Friday. The new line, the 17th, will start commercial operation within the first half of 2014. Samsung, however, is highly likely to skip the groundbreaking ceremony for the plant, the officials said. The latest factory-building plan is a part of this year’s 15 trillion won investment plan in chips by Samsung, the officials said.The new line will only produce profitable non-memory and foundry chips, according to the officials. 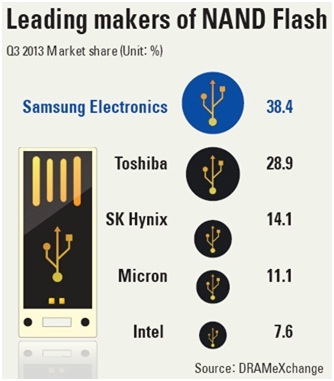 Samsung is also planning to switch some of its existing memory chip-producing lines into non-memory chips, though the company declined to confirm.